Mobile phones have changed the way we live our lives and to many, the prospect of a world without voice calling Make Free Calls from iPhone With The Official Google Voice App Make Free Calls from iPhone With The Official Google Voice App Read More , text messaging Adding Events To Google Calendar Via SMS (And More!) Adding Events To Google Calendar Via SMS (And More!) So many of us use Google Calendar every day without once thinking about all the extra useful things it's capable of doing for you. Every now and then you probably find yourself paying attention to... Read More and mobile Internet Reduce Your Mobile Internet Data Usage & Save Money with Onavo [iOS] Reduce Your Mobile Internet Data Usage & Save Money with Onavo [iOS] Fast and reliable WiFi connections are not everywhere. Most of the time, especially in developing countries, people have to rely on slower and more expensive carriers' data connections. What can customers do to save money?... Read More access is an unsettling one. As we all know, mobile phones didn’t just happen overnight. They grew up, just like us. Mobile phones evolved over five different generations, the latest of which is still being rolled out and adopted by consumers. Don’t worry – by the time most of us will have switched to 4G there will undoubtedly be yet another standard to aspire to. Today we’ll be dialing into the past and briefly examining the history of mobile phones. AT&T were one of the first to commercialize mobile telecommunication in 1947. The service known simply as “Mobile Telephone Service” (MTS) spread to more than a hundred towns and highway paths by the end of the year. The service relied on an operator to connect both incoming and outgoing calls. The telephones used were not particularly portable and used a half-duplex “press to speak” system where the caller would have to release the button to hear the other person. That very same year two Bell Labs engineers proposed the foundations for the modern cellular network. At the time the plans were daring, and it took until the 1960s for the plans to be implemented and even longer to come to market. MTS was used in North America until the 1980s, despite AT&T’s introduction of the aptly-named Improves Mobile Telephone Service (IMTS) in 1965. The new service introduced user dialing, removed the need for operator forwarding and used additional radio channels which increased the number of possible subscribers and calls, as well as area coverage. IMTS was still mobile telephony in its infancy however, and was limited to 40,000 subscribers nationwide. In New York city, 2,000 customers shared 12 radio channels which on average took 30 minutes to place a call. Radio Common Carriers (RCCs) were another solution designed to compete with AT&T’s MTS and IMTS systems. Not only were the units huge (see above) but standards varied widely. Some phones were half-duplex “push to talk”, some were full-duplex much like a wired telephone. 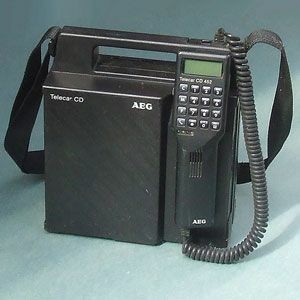 Some lucky customers even carried around briefcase-sized full duplex devices, though RCC units were mainly limited to cars. In 1960 the world’s first fully automated mobile telephone was introduced in Sweden. The system allowed for automated connection from a rotary handset (that’s the circular dialing knob to me and you) mounted within a car, but required an operator to forward calls. The system was known as Mobile Telephone system A (MTA) and was replaced by MTB two years later. In this interim period there were several other solutions including the arrival of Motorola on the scene in 1959 and Bulgarian and Russian (then USSR) solutions sprouted up too. It wasn’t until 1971 when the ARP network was introduced to Finland that the world’s first successful commercial network was launched. The system relied on cars, began as half-duplex but soon evolved and had over 35,000 subscribers by 1986. Dr Martin Cooper, a Motorola researcher and executive made the first phone call from a handheld mobile phone on April 3, 1973. This ushered in a new dawn of communication. The first generation of cellular networks paved the way to the networks we know and use today. Use of multiple cell tower sites, each connected through a network, allowed users to travel and even switch cell towers during a call. It was a revolution built on existing, analog technology with the first being built in Chicago in 1977. Known as the Analong Mobile Phone System (AMPS), it was built by AT&T and it took the FCC 11 years to approve AT&T’s initial proposal in 1971 before they were assigned the 824-894MHz range on which to operate AMPS. As technological advancement picked up the pace, so did mobile phones. The 1990s saw the arrival of two new, digital technologies – the European GSM standard and the North American CDMA standard. Demand grew and more and more cell tower sites were built. In addition to technological improvements in batteries and internal components, this allowed for much smaller mobile devices. Another advancement made possible by 2G was the introduction of SMS messaging, with the first computer generated SMS sent in 1992 in the UK. A year later in Finland, the first person-to-person SMS was delivered using GSM technology. As popularity grew, pre-paid mobile phones and plans emerged in the late 1990s which further popularized SMS amongst all ages. The very first download services were also introduced using 2G technology and enabled users to download ringtones. Mobile phones also saw use as another method of payment for services like car parking in Finland and vending machines. NTT DoCoMo pioneered the first mobile Internet service in Japan in 1999 on existing 2G technologies, but it was soon replaced with their launch of the world’s first 3G network in October 2001. Many countries followed suit in the following years including South Korea, the US and the first European 3G networks which sprang up in the UK and Italy in 2003. While 3G was still being developed a number of “2.5G” services appeared in an attempt to bring older technologies up to speed. Unfortunately speed was the lacking factor, and while technologies like GPRS and EDGE provided improvements over standard 2G, they did not match the speed of existing 3G technologies. 3G transformed the mobile phone industry and enabled widespread mobile Internet and the transmission services like TV and Radio for the very first time. Handset manufacturers jumped on the bandwagon and smartphone use took off. By around 2005 3G had evolved a step further, leading many to coin the terms “3.5G” “turbo 3G” and “3G+” in reference to HSPDA (High Speed Downlink Packet Access), HSPA and HSPA+. While no official standards exist for 4G, a few technologies have laid claim to the title. The first was WiMAX, offered by Sprint in the US but perhaps the most successful has been LTE, which is popular also in North America but non-existent in some territories such as Australia. 4G marks the switch to native IP networks, bringing mobile Internet more in-line with wired home Internet connections. Speed is of course the big advantage, with potential advancements of ten times over 3G rates. The fourth generation of mobile communication Gs & LTEs: Understanding Mobile Broadband [Technology Explained] Gs & LTEs: Understanding Mobile Broadband [Technology Explained] Connecting to the Internet was once all about big honking cords. The cords might be telephone lines, or cable lines, or FiOS lines specifically installed for Internet service, but the running theme is a line... Read More is still evolving, and we’re bound to see new standards, speed increases and coverage benefits in the next few years. For a better understanding of 3G and 4G mobile Internet, check out this article. Briefly tapping such a rich history of mobile phones is difficult, but I think we’ve covered the major events, devices and happenings in the world of cellular communication. Many will of course remember these developments, but for those that don’t, spare a thought for the pioneers of analog, the original digital voice-only networks and the pitiful Internet speeds that 2G networks offered the next time you’re Tweeting and Facebooking on your iPhone. damn that guy was holding a brick to his ear. Does anyone remember Michael Douglas (Gordon Gekko) using a Motorola DynaTAC in Wall Street?